Best 4 pc. travel spin rods? Why not just order a travel rod from Europe? If you are buying something in $200 range, you may pay $40-50 in shipping. But you are not paying any European taxes. So your out-of pocket cost ordered from Europe online and shipped to US would be about the same as buying the same rod in a store in Europe. With some high-end rods and reels (that are available here) you may actually save money having them shipped from Europe. This opens up a whole world of travel rods. Perhaps way more than most would want to consider. What does mud refer to? Using a lure that kicks up mud? Or seeking out muddy bottom? I tried most travel rods out there. My favorite for saltwater fishing are 5-piece Shimano Exage STC rods. They have a huge range of travel rods in every length and size. My favorites are 9 and 10 foot (270 and 300 cm) extra heavy bx models that I use for surf. They are very fast and sensitive rods that I love. They also have great 5-6 piece 11 footers in stc “beastmaster” series. These are available in slower tapers and lighter actions. I love shimano STCs so much that I amassed a collection of them and often fish them locally instead of 1 or 2 piece rods. They are so sensitive and strong that there is really no downside to 5-6 piece composition. Shimano STCs are not avalable on US market, but are the most popular travel rods everywhere else in the world. I ordered mine from Europe. But they are also available in Canada. Does anyone specifically target winter flounder in the Northeast? When us the best time to catch them in Long Island? For shore fishing, what rigs and baits do you prefer? Do the early bass that are just starting to bite in Long Island behave differently now than they do in the fall? What bait are they looking for? Are they faster or slower? How do you adjust your fishing technique for early bass? Lures or bait this time of the year? What’s the best way to catch the earliest of stripers and blues? For the greatest chance of hooking a fish in early April, would you go with lures or bait? What lure or bait would you use? Mag Minnows. Do they work? 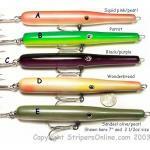 Has anyone had any luck in the surf with smaller size mag minnows (the second largest 4+ inch one? You mean the golden flaxen? I was actually asking about the type of paint that holds up well on the lure. Is there a particular brand? Did you strip off the underlying paint? For those that do use scents, how do you wipe/wash it off prior to putting it in the bag? Wow! So beautiful. What paint did you use? How do you scent your lures to make them irresistible? Sluggo or Gulp Eel to catch dinner for your King? It’s this thing that eats single-hooked serpentine-groveling sluggos.